Laribacter hongkongensis is associated with community-acquired gastroenteritis and traveler's diarrhea and it can reside in human, fish, frogs and water. In this study, we performed an in-depth annotation of the genes in its genome related to adaptation to the various environmental niches. L. hongkongensis possessed genes for DNA repair and recombination, basal transcription, alternative σ-factors and 109 putative transcription factors, allowing DNA repair and global changes in gene expression in response to different environmental stresses. For acid stress, it possessed a urease gene cassette and two arc gene clusters. For alkaline stress, it possessed six CDSs for transporters of the monovalent cation/proton antiporter-2 and NhaC Na+:H+ antiporter families. For heavy metals acquisition and tolerance, it possessed CDSs for iron and nickel transport and efflux pumps for other metals. For temperature stress, it possessed genes related to chaperones and chaperonins, heat shock proteins and cold shock proteins. For osmotic stress, 25 CDSs were observed, mostly related to regulators for potassium ion, proline and glutamate transport. For oxidative and UV light stress, genes for oxidant-resistant dehydratase, superoxide scavenging, hydrogen peroxide scavenging, exclusion and export of redox-cycling antibiotics, redox balancing, DNA repair, reduction of disulfide bonds, limitation of iron availability and reduction of iron-sulfur clusters are present. For starvation, it possessed phosphorus and, despite being asaccharolytic, carbon starvation-related CDSs. The L. hongkongensis genome possessed a high variety of genes for adaptation to acid, alkaline, temperature, osmotic, oxidative, UV light and starvation stresses and acquisition of and tolerance to heavy metals. In 2001, Laribacter hongkongensis, a novel genus and species that belongs to the Neisseriaceae family of β-subclass of the Proteobacteria, was discovered from the blood and empyema pus of a patient with underlying alcoholic cirrhosis . Subsequently, it was observed that L. hongkongensis was associated with community-acquired gastroenteritis and traveler's diarrhea in human [2–5]. L. hongkongensis is capable of living under a variety of ecological niches. In addition to humans, L. hongkongensis resides in the intestines of a variety of freshwater fish, most commonly those of the carp family, including grass carps (Ctenoharyngodon idellus), bighead carps (Aristichthys nobilis) and mud carps (Cirrhina molitorella), as well as those of frogs [4, 6–9]. Moreover, it can also survive and replicate as a free living bacterium in water obtained from drinking water reservoirs . To survive in these ecological niches, L. hongkongensis needs the capability of protecting DNA damages by endogenous and exogenous metabolites and regulating the expression of a variety of genes, which makes it able to adapt to different temperatures, pH and osmotic pressures, as well as oxidative and ultraviolet light stresses. In this article, we present an overview of the genes of the L. hongkongensis genome related to DNA repair and recombination and regulation of gene expression. In addition, the putative genes and mechanisms that enable L. hongkongensis to adapt to different temperatures, pH and osmotic pressures, as well as oxidative and ultraviolet light stresses were also presented. These genes of L. hongkongensis were compared to those of Neisseria gonorrhoeae, Neisseria meningitidis and Chromobacterium violaceum, the other three bacteria of the Neisseriaceae family of β-proteobacteria with complete genome sequences available [11–13]. Human is the only known reservoir and host for N. gonorrhoeae and N. meningitidis. N. gonorrhoeae is most commonly associated with sexually transmitted infections and N. meningitidis is most commonly associated with pyogenic meningitis and bacteremia. C. violaceum is highly versatile and can be found abundantly in multiple ecosystems, including water and soil, in tropical and subtropical regions. It is associated with infrequent but potentially fatal infections in humans. Several pathways are involved in the repair of mutagenic and cytotoxic effects of DNA damage that can arise through endogenous and exogenous stress in bacteria. Reversion of the damaged base is the simplest DNA repair mechanism, which involves a single-step reaction by specific enzymes. Photoreactivation and alkylation repair are two of the most well-known damage reversion mechanisms. Photoreactivation is carried out by photolyase, which acts upon lesions induced by UV irradiation in a light-dependent reaction. A gene homologous to phrB, which encodes a photolyase, was found in the L. hongkongensis genome (Table 1). Alkylation repair is mediated by the enzymes alkyltransferases, encoded by ogt and ada, as well as iron-dependent dioxygenases, encoded by alkA, which remove added alkyl groups from duplex DNA. Genes encoding for all three enzymes could be found in the L. hongkongensis genome (Table 1). Since L. hongkongensis can survive in natural water environments and is therefore often exposed to sunlight, these enzymes may be important for protection against such DNA damage. This is in contrast to N. meningitidis which lacks alk and some meningococcal and gonococcal strains which lack photolyase activity, which may reflect the lack of light exposure in the neisserial habitat . L. hongkongensis is exposed to reactive oxygen species generated during normal cellular metabolism, as well as from oxidative bursts from its host. One of the most important protective defense mechanisms against such DNA damage is the base excision repair (BER) pathway, which recognizes a wide range of DNA lesions. This includes the most frequently encountered form of oxidative DNA damage: production of 7, 8-dihydro-8-oxo-2'-deoxyguanosine (8oxodG) which can lead to ambiguous base pairing (either A or C) during DNA replication. The BER pathway is carried out by two types of enzymes: glycosylases and AP-endonucleases. Glycosylases excise the damaged base from the sugar phosphate backbone, leaving abasic (AP) sites, and endonucleases incise the 5' or 3' phosphodiester from the AP site to generate a nucleotide gap. There are eight glycosylases and endonucelases in the L. hongkongensis genome. Among the glycosylases, the uracil DNA glycocosylase (UNG) is the most well characterized enzyme found in various bacteria and eukaryotes. It is responsible for the excision of uracil residues from DNA which can arise as a result of misincorporation of dUMP residues by DNA polymerase or due to cytosine deamination. Similar to C. violaceum, the most closely related bacterial species of the Neisseriaceae family with complete genome sequence available, the L. hongkongensis genome contains two copies of UNG (Table 1). The complete 8oxodG system (GO system) is also present, which involves MutM/FPG, MutT and MutY, which act together to protect the bacterium against the effects of 8oxodG in E. coli. MutM or FPG is formamidopyrimidine DNA glycosylase that recognizes oxidized purines such as 8oxodG and imidzole ring-opened purines; while MutY is an atypical glycosylase which removes adenine from DNA when it is mispaired with 8oxodG, preventing GC to TA transversions . In N. meningitidis, it has been shown that MutY has a prominent role in DNA repair, with mutY mutants exhibiting high spontaneous mutation rates . Nucleotide excision repair (NER) involves a group of highly conserved proteins and repairs bulky lesions caused by exogenous damage such as UV light that generate a large helical distortion [18, 19]. NER is carried out by the UvrABC complex in E. coli, which excises a 24- to 32-bp DNA fragment that contains the damaged lesion . A functional NER pathway has also been demonstrated in N. gonorrhoeae. Similar to N. gonorrhoeae, N. meningitidis and C. violaceum[14, 15, 21], homologues of all enzymes in this pathway are present in the L. hongkongensis genome (Table 1). The mismatch repair (MMR) system recognizes and removes single-base mismatches as well as small nucleotide insertions or deletions (forming small loops) that result from errors during replication. In E. coli, MMR is carried out by a number of enzymes working at a sequential manner: MutS recognizes the mismatch; MutL is recruited and binds as a dimer; the bound MutS-MutL complex in turn recruits the MutH endonuclease; MutH nicks the nascent DNA strand, distinguishing it from the parental strand by its under-methylation of GATC sequences; MutU (also known as UvrD) and other exonucleases (such as RecJ or ExoI) mediate the removal of up to 1000 bases (upstream or downstream) of the strand that contain the lesion [22, 23]. This strand is then repaired by the actions of DNA polymerase I. Similar to N. meningitidis and C. violaceum[14, 15], the L. hongkongensis genome contains the most important enzymes of the MMR pathway except that mutH is absent, suggesting that this gene has been lost in related bacterial lineages (Table 1). In N. meningitidis, it has been shown that mutS mutants had a significantly increased frequency of phase variation and moderate increases in the rate of missense mutations . However, other mechanisms are likely involved in determining meningococcal mutability. Further studies are required to investigate if MutH function is not required or another protein carries out the MutH strand-specificity function in these bacteria of the Neisseriaceae family. In contrast to C. violaceum, N. meningitidis and N. gonorrhoeae which possess only one copy of the Dam protein, which is responsible for DNA methylation, the L. hongkongensis genome contains three copies of dam. These three Dam homologues are phylogenetically most closely related to the Dam of C. violaceum, with two of the three copies having identical nucleotide sequences encoded on two highly similar prophages (Figure 1). It has previously been reported that the Dam methylase from C. violaceum has high similarity to a bacteriophage Dam homologue, suggesting acquisition via a horizontal transfer event . Although our analysis shows that the Dam proteins from L. hongkongensis and C. violaceum are only distantly related to homologues found in other bacteriophages, the phylogenetic clustering of enzymes from different classes of bacteria supports that this enzyme is frequently horizontally transferred between bacteria (Figure 1). Phylogenetic tree showing the relationships of the three copies of Dam methylases from L. hongkongensis (LHK_01749, LHK_02602 and LHK_00398) to those from other bacteria. The unrooted tree was constructed by neighbor-joining method using Kimura's two-parameter correction, with bootstrap values calculated from 1000 trees. The scale bar indicates the estimated number of substitutions per 20 bases. Bacterial names and accession numbers are given as cited in the GenBank database. Phylum or class is indicated in parentheses. Genes identified in bacteriophages are highlighted in grey. Recombinational repair is activated in response to double-strand breaks (DSBs) in DNA which can lead to broken chromosomes and cell death. Such damage is repaired by homologous recombination in a process known as double-strand break repair (DSBR); which involves initiation, strand pairing and exchange, branch migration and branch resolution. Similar to the pathogenic Neisseria species and C. violaceum[15, 25, 26], the L. hongkongensis genome possesses all the important genes in this pathway, including the recA gene universally found in bacteria (Table 2). RecA has an important role in pathogenic Neisseria species, being involved in repeat-associated events, including those associated with pilus antigenic variation and transformation in N. meningitidis. The L. hongkongensis genome contains two pathways for repair initiation (RecBCD and RecFOR), and two pathways for branch migration and resolution (RuvABC and RecG). In addition to recombination repair, the RecBCD and RecN are also involved in recombination during transformation, and RecO, RecQ and RecJ in antigenic variation in N. gonorrhoeae[25, 27]. However, it remains to be seen if these components possess similar function in related species including L. hongkongensis. Interestingly, homologues of the Bet and Exo recombinational repair proteins from bacteriophage lambda are present within a probable 11kb defective prophage region on the L. hongkongensis chromosome. Bet is a single-stranded DNA annealing protein (SSAP, sometimes also referred to as a synaptase), and Exo is a single-stranded DNA alkaline exonuclease with 5'- to 3'-polarity . The bet and exo genes are positioned immediately adjacent to one another along with an additional copy of a single-stranded DNA binding protein of phage origin (ssb2, LHK_01496), which is homologous to, but distinct from, the presumed major functioning ssb of neisserial origin (LHK_01479). Such arrangements of phage-related DNA recombination proteins are commonly found in bacteria , acquired presumably by phage integration followed by subsequent genetic rearrangement. If actively transcribed, functional pairs of Exo and Bet proteins will promote DNA recombination events analogous to those mediated by the RecA/RecBCD/RecFOR pathways, and would be expected to increase the rates of gene/genome rearrangements . The Bet and Exo proteins may also function synergistically with RecA. The transcriptional status of the genes within this presumed defective prophage region remain to be established. It has previously been noted that low-GC Gram positive species tend to possess RecT SSAPs rather than Bet-family proteins , although this relationship has not been re-examined more recently. The LHK_01498 gene is the only bet homologue present in the Neisseriaceae. However, there is a (functionally-equivalent) recT homologue present in Kingella oralis ATCC51147 (the only recT-family recombinase present in the Neisseriaceae) which does appear to have partnering exonuclease. Due to likely (partial) genetic reassortment in a phage host prior to incorporation into the L. hongkongensis genome, the bet, exo and ssb2 genes have apparently unrelated phylogenies (data not shown). The 162aa Ssb2 protein homologue is 69% identical to the presumed functional Ssb protein within the cell (175aa), but protein alignment reveals that it is lacking a stretch of ca. 25 amino acids near the C-terminus (data not shown). Interestingly, structural studies on the E. coli Ssb-DNA complex have shown that this unstructured region loops out from the SsB tetramer . This region is not involved in DNA binding, but is thought to be responsible for interacting with the DNA primase and clamp loader proteins . This suggests that the Ssb and Ssb2 proteins are designed to work with quite different replication or DNA repair protein systems. The SOS response is activated when replication is blocked by DNA damage. The pathway is responsible for activation of a variety of physiological responses, including cell cycle inhibition and various DNA repair pathways. In E. coli, the SOS response involves more than 40 genes which are induced when there is a large amount of DNA damage, allowing increased repair and restoration of replication . The pathway is controlled by a dual-component system, with RecA being the activator and LexA the repressor. The RecA protein forms a complex with single-stranded DNA, which leads to cleavage of LexA repressor and expression of the SOS regulon. Although genes related to SOS response, including dinB, dinG, umu-D and dnaA, could be identified, the lexA is absent in L. hongkongensis genome, a phenomenon also observed in C. violaceum, N. meningitidis and N. gonorrhoeae[14, 15, 33] (Table 3). This suggests that the lexA gene is lost in the common ancestor of these bacteria during evolution. Moreover, the recA, uvrA and uvrB genes of N. gonorrhoeae are known to lack the characteristic lexA-binding site or SOS boxes, the general hallmarks of an active SOS response. In fact, it is been experimentally confirmed that a functional SOS response is absent in N. gonorrhoeae. Similarly, SOS boxes cannot be identified in the homologues of SOS-inducible genes in N. meningitidis[14, 35, 12], suggesting that the SOS response may also be absent in related bacteria of the same family. Similar to the two Neisseria species and C. violaceum, SOS boxes are also absent in the SOS-related genes in L. hongkongensis. Further studies are required to determine if SOS response is constitutive or absent in this group of bacteria. Bacterial DNA replication mechanisms are responsible for the accurate duplication of genetic material during cell division. The whole process involves the interplay of many different proteins with a variety of functions. A total of 36 coding sequences (CDSs) potentially involved in DNA replication are present in the L. hongkongensis genome, including 12 initiation factors, 11 elongation factors, 2 termination factors and 5 topoisomerases (Table 4). Since many of these proteins are essential to the bacterial cell and therefore preserved during bacterial evolution, they are often highly conserved among phylogenetically closely related bacteria. In L. hongkongensis, there is an oriC containing eight 9-bp repeat elements known as DnaA boxes, which are potential binding sites for the initiator protein DnaA. The DnaA in L. hongkongensis is highly conserved when compared to those in closely related bacteria, with 76.7% amino acid identity with the homologue from Lutiella nitroferrum. The four domains of DnaA previously identified to possess distinct functions are also present . As DnaA assembles with oriC to form a large nucleoprotein complex, the DNA melts to generate single DNA strands necessary for the binding of a helicase, DnaB, and the replisomal machinery . Although bacteria do not possess histones, their genomes are arranged in tightly compacted arrangements known as nucleoids, which are important for maintaining an optimal DNA topology for replication initiation. Six nucleoid-associated proteins, also referred to as histone-like factors, were identified in the L. hongkongensis genome, including two HU-beta proteins, one HN-S protein, two integration host factors (IHF) and one factor for inversion stimulation (Fis). HU-beta and HN-S proteins bind DNA non-specifically and contribute to the global condensation of bacterial chromosomes . IHF and Fis recognize specific DNA sequences and assist in organizing supercoiled domains [36, 38]. Earlier studies have shown that IHF stimulates DnaA-mediated unwinding of oriC, whereas Fis inhibits DUE melting [39, 40]. The L. hongkongensis genome contains three copies of dam and one copy of the hda gene which are likely involved in the regulation of the replication process. Dam is an adenine methyltransferase responsible for the methylation of GATC sites of the oriC in E. coli which is important for origin sequestration, thus preventing re-initiation. Hda, a homologue of DnaA, is involved in the regulatory inactivation of DnaA (RIDA), which directly stimulates ATP hydrolysis by DnaA after the initiator melts the DUE . It has been shown that hda-deficient cells display an over-initiation phenotype in E. coli[41, 42]. As for other bacteria, the principal mechanism for control of gene expression is through regulation of the amount of mRNA produced from the corresponding gene. This is primarily determined by the affinity of RNA polymerase for the promoter. In L. hongkongensis, this is exemplified by the difference in mRNA levels of argB-20 and argB-37 at different temperatures, resulting in different amounts of the two enzymes, N-acetyl-L-glutamate kinase (NAGK)-20 and NAGK-37 respectively . Genes that encode proteins which control basal transcription, including the five-subunit RNA polymerase core enzyme (α2ββ'ω) and σ-factors for binding specifically to different classes of promoters and hence selective expression of different groups of genes, are present in the L. hongkongensis genome. The primary σ-factor, σ70, is responsible for recognizing the promoters for transcription of most of the housekeeping genes. Furthermore, the L. hongkongensis genome contains other alternative σ-factors, including σ28 (FliA), σ32 (RpoH), σ38 (RpoS), σ24 (RpoE) and σ54 (RpoN), which allow it to bring about global changes in gene expression in response to different environmental stresses (Table 5). The types of alternative σ-factors in L. hongkongensis are the same as those in C. violaceum, except that there are two copies of σ28 (the flagellar σ-factor) in the C. violaceum genome but only one copy of σ28 in the L. hongkongensis genome. In the genomes of N. gonorrhoeae and N. meningitidis, no σ28 and σ38 (the starvation/stationary phase σ-factor) are observed. In addition to RNA polymerase and the σ-factors, the L. hongkongensis genome also encodes transcriptional activators and repressors, which belong to a variety of families of transcription factors. These transcription factors bind to sites near the target promoter and stimulate or repress the activity of the corresponding σ-RNA polymerase holoenzyme. In the L. hongkongensis genome, 109 coding sequences (CDSs) that encode putative transcription factors were identified (Table 6). Among the 46 families of bacterial transcription factors, L. hongkongensis contains genes that encode putative transcription factors in 22 of them. The largest groups belong to the LysR families. In most of the families, the number of genes in the L. hongkongensis genome that encode putative transcription factors in that family is in between that of C. violaceum and the Neisseria species (Table 7). This is in line with the ability of C. violaceum to survive in a wide range of environments and the fastidious growth requirements and limited host range of N. gonorrhoeae and N. meningitidis. One of the exceptions is that L. hongkongensis possesses three CDSs that encode putative transcription factors of the cold shock family, more than those in the genomes of C. violaceum, N. gonorrhoeae and N. meningitidis. This may be related to the adaptability of L. hongkongensis to environments of low temperatures, such as those of freshwater fish and frogs. Distribution of transcription factors families in L.hongkongensis, N. meningitidis, N. gonorrhoeae and C. violaceum. L. hongkongensis is able to grow at pH of as low as 2 (unpublished data), and its tolerance to acid stress is much higher than that of N. gonorrhoeae, N. meningitidis and C. violaceum. This is in line with the recovery of L. hongkongensis from stool samples of patients with gastroenteritis, as it has to pass through the highly acidic environment of the stomach before reaching the intestine. Therefore, it is not surprising that L. hongkongensis possesses abundant mechanisms for tolerating acid stress compared to N. gonorrhoeae, N. meningitidis and C. violaceum. The genome of L. hongkongensis contains a complete urease gene cassette and two arc gene clusters. The urease cassette contains eight CDSs encoding three structural (UreA, UreB and UreC) and five accessory proteins (UreE, UreF, UreG, UreD and UreI), whereas each arc cluster consists of four CDSs encoding the three enzymes, arginine deiminase, ornithine carbamoyltransferase and carbamate kinase, of the arginine deiminase pathway, and a membrane bound arginine-ornithine antiporter. Urease hydrolyzes urea into carbon dioxide and ammonia, whereas the arginine deiminase pathway converts L-arginine to carbon dioxide, ATP, and ammonia. The ammonia generated from both pathways raises the pH and counteracts the acid stress. A similar urease gene cassette is not present in the genomes of N. gonorrhoeae, N. meningitidis and C. violaceum, whereas one arc gene cluster is present in the C. violaceum genome, but not in that of N. gonorrhoeae or N. meningitidis. In addition to the urease cassette and arc clusters, the L. hongkongensis genome also contains three CDSs that encode putative chaperones of which their transcription can also potentially be induced by acid shock. These include dnaK, mopA1 and htpG. Furthermore, other gene products may help the bacterium to survive in acidic environment or their expression can be induced by acid stress (Table 8). The functions of some of these gene products are unknown, but the survival of the respective bacteria at low pH had been shown to be affected if the corresponding gene was deleted [44–49]. Other CDSs related to acid stress in L.hongkongensis, N. meningitidis, N. gonorrhoeae and C. violaceum. L. hongkongensis is able to grow at pH as high as 9.0 (unpublished data). While this may be related to its ability to survive the alkaline pH in the host intestine, growth at such alkalinity is still in line with many other non-extremophilic bacteria. Adaptive mechanisms to achieve cytoplasmic pH homeostasis in bacteria include transporters and enzymes that promote proton capture and retention, production of acidic metabolites and cell surface changes . Among all these mechanisms, the most widely studied ones involve the transporters. In the genome of L. hongkongensis, there are four CDSs coding for putative transporters which belong to the monovalent cation/proton antiporter-2 (CPA2) family. Two of the CDSs code for putative Na+/H+ exchangers (LHK_02296, LHK_00707) while the other two code for the putative genes kef (LHK_02848) and kefB (LHK_02018). No CDS encoding putative homologue of monovalent cation/proton antiporter-1 (CPA1) or monovalent cation/proton antiporter-3 (CPA3) has been identified. Transporters of the monovalent cation/proton antiporter (CPA) superfamily support key physiological functions of bacteria by catalyzing active efflux of Na+ and/or K+, with respective H+ influx, to maintain cytoplasmic pH homeostasis and tolerate fluctuations in osmolarity . Since cytoplasmic bacterial parasites or symbionts are sheltered by the host cell, it has been postulated that their genomes encode few genes for Na+/H+ antiporters . A comparison of L. hongkongensis, C. violaceum, intracellular pathogens N. gonorrhoeae and N. meningitidis, as well as the two model bacterial organisms, Bacillus subtilis and Escherichia coli, are shown in Table 9. It can be observed that L. hongkongensis and C. violaceum have more genes predicted to encode CPA2 superfamily transporters when compared to N. meningitidis and N. gonorrhoeae. cNot listed on www.membranetransport.org, see Krulwich et. al. In addition to the four CDSs coding for the putative transporters of the CPA2 family, two CDSs putatively coding for transporters of the NhaC Na+:H+ antiporter (NhaC) family are also present (LHK_00646, LHK_02247) in the L. hongkongensis genome. Both are predicted to code for the gene nhaC. Nevertheless, gene sequences of the two CDSs are significantly different, indicating a possible difference in phylogenetic origin. The nhaC homologue in the alkaliphilic bacteria Bacillus firmus has been confirmed experimentally to produce NhaC, which has Na+/H+ antiporter activity . Table 9 also compares the number of identified NhaA, NhaB, NhaC and NhaD family transporters in the genomes of L. hongkongensis to those in C. violaceum, N. meningitidis, N. gonorrhoeae, B. subtilis and E. coli. To adapt to natural freshwater, L. hongkongensis should be able to acquire essential heavy metal ions and expel them, or their toxic counterparts, when their levels reach toxicity. Many heavy metals belong to the transition elements. Their electronic configurations provide them with an exquisite ability to form complex compounds. Metal ions such as iron(II), cobalt(II), nickel(II) and copper(II) are essential to many physiological functions, yet are toxic at high concentrations. Certain species, such as silver(I), cadmium(II) and mercury(II), however, are relatively toxic to bacteria; the toxic complexes formed by these ions preclude their physiological use by common bacteria . Iron is required by both prokaryotes and eukaryotes for the synthesis of important proteins such as cytochromes. Bacteria employ a variety of mechanisms to acquire iron, such as siderophore-mediated uptake, metal inorganic transport systems (MIT) and ATP-binding cassette (ABC) transport systems. No gene for siderophore production was found in the L. hongkongensis genome. Since heme-bound iron and iron-containing proteins may not be readily available outside of a host , transporter-mediated transport of ionic iron would be the probable mechanism of iron acquisition during the environmental persistence of L. hongkongensis. A locus coding for the periplasmic ferric iron binding protein FbpA, permease FbpB and a putative iron-transport system ATP-binding protein is present (LHK_02634-02636). Putative homologous loci, containing three similar CDSs, is present in C. violaceum (CV1908-1910), N. gonorrhoeae (NGO0215-0217) and N. meningitidis (NMB0632-0634). The gene coding for the putative iron-transport system ATP-binding protein in L. hongkongensis (LHK_02636) is probably homologous to the fbpC gene in N. meningitidis. The FbpABC system has been shown to be a specific ferric iron transport system with high affinity to Fe3+ in Haemophilus influenzae. In addition, two CDSs are the putative homologues of the genes coding for the high-affinity ABC transport system for ferrous iron in E. coli (feoABC) are present in the L. hongkongensis (LHK_03044-03045). The two CDSs code for the putative homologues of feoA and feoB respectively. The putative homologue of feoB is also present in C. violaceum. No putative homologues of feoA or feoC are found in N. gonorrhoeae and N. meningitidis. Nickel is an essential component of urease, which is implicated in the acid tolerance of L. hongkongensis. The CorA and HoxN systems have been proposed as an important nickel and cobalt transport system in bacteria . No putative CDS coding for genes of the CorA system is present in the L. hongkongensis genome, yet a CDS coding for a histidine-rich glycoprotein with functional domain of the high-affinity nickel transport protein NicO was identified (LHK_02812). The NicO protein is related to the NixA of the HoxN family, which has been implicated in the urease-dependent pathogenesis of Helicobacter pylori. A locus of four CDSs coding for dppB, dppC, dppD and dppF (LHK_00939-00942) was found. They belong to an ABC transporter subfamily and are predicted to transport dipeptides, oligopeptides and nickel. The dppA homologue (LHK_00667) is located distant from the dppBCDF locus. This is in contrast to C. violaceum, where the CDS coding for the putative dppA gene is contiguous to the dppBCDF locus. This separation of dppA from the dppBCDF locus, however, is not unique; it is also observed in H. influenzae. The relatively well-characterized nickel/cobalt resistance system Cnr  and nickel/cobalt/cadmium resistance system Ncc  find no direct homologous systems in the L. hongkongensis; whilst the putative gene coding for a protein of similar function, in terms of sequence homology and functional domains, is traced to a CDS which encodes the putative NolG efflux pump of the resistance-nodulation-cell division superfamily (LHK_02819). In addition, two CDSs coding for an ABC transporter for cobalt (LHK_01077-01078) were found; it is uncertain whether this member of the nickel(II)-cobalt(II) uptake transporter (NiCoT) family may also transport nickel due to variations in the exact level of binding specificity . Homologues of putative genes encoding dppA, dppBCDF (LHK_00667, LHK_00939-00942) and the histidine-rich glycoprotein (LHK_02812) were identified in the genome of C. violaceum but not published genomes of N. gonorrhoeae or N. meningitidis. No putative homologue of the locus containing genes coding for the ABC transporter for cobalt (LHK_01077-01078) was identified in C. violaceum, N. gonorrhoeae or N. meningitidis. Cobalt is found in coenzyme B12, which is responsible for methyl group transfer and rearrangement [61, 62]. Apart from the HoxN and NiCoT described, three CDSs that encode a putative ABC-type cobalt transport system (LHK_01956-01958) and one that codes for a putative magnesium and cobalt efflux protein (LHK_00289) were also found. No putative homologue of the ABC-type cobalt transport system was found in C. violaceum, N. meningitidis and N. gonorrhoeae. For the putative magnesium and cobalt efflux protein gene, putative homologues were found in C. violaceum, N. meningitidis and N. gonorrhoeae as corC. A CDS coding for a cadmium-translocating P-type ATPase (CadA-1, LHK_00449) was found in the genome. CadA and CadA-like proteins have been implicated in the transport of various heavy metals include, but not limiting to, cadmium, cobalt, mercury, lead and zinc ; CadA has been shown to be responsible for the Cd2+ efflux in both Gram-positive bacteria such as Staphylococcus aureus and Bacillus spp. ; and Gram-negative bacteria such as Ralstonia metallidurans. It may also contribute to Pb2+ efflux . cadA-1 is very similar to the E. coli gene zntA, which has been shown to be responsible for the intrinsic resistance of E. coli to zinc and cadmium . Probable homologues and paralogues of cadA-1 and CadA-like protein coding genes are present in C. violaceum as zntA and copA; in N. meningitidis and N. gonorrhoeae as putative transport ATPase genes. A locus of two CDSs (LHK_03034-03035) coding for a putative copper translocating ATPase and a conserved heavy metal associated domain were also found in the genome. The putative copper translocating ATPase gene has a homologue, copA, in E. coli; copA in E. coli has been shown to be important in resistance to the toxic effects of copper, and is induced by silver and copper ions . Putative homologues of this copper translocating ATPase gene (LHK_03035) are also present in C. violaceum (copA), N. meningitidis and N. gonorrhoeae. L. hongkongensis inhabits the intestines of freshwater fish, frogs and human [4, 6–9]. It is also able to survive freely in freshwater environment . In contrast to human, the body temperatures of freshwater fish and frogs vary with the environmental temperature. The ability to survive in such a wide range of habitats is in line with its ability to survive from 15°C to 42°C, although its growth rate is higher at higher temperatures . In an experiment that examined the differential gene expression of L. hongkongensis at 20°C to 37°C using proteomics study, we found that there were 12 differentially expressed protein spots involved in various functions . Seven spots were more highly expressed at 20°C than at 37°C and five more highly expressed at 37°C than at 20°C. Among these were NAGK-37 that was up-regulated at 37°C and NAGK-20 that was up-regulated at 20°C. These two isoenzymes of NAGK catalyze the second step of the arginine biosynthesis pathway. In addition to the differentially expressed genes detected by 2-dimensional gel electrophoresis, the L. hongkongensis genome also contains other genes that could be of importance for adaptation to different temperatures. These include genes related to chaperones and chaperonins, heat shock proteins and cold shock proteins. Overall, the number of CDSs in the L. hongkongensis genome encoding putative chaperones and heat shock proteins is lower than that in C. violaceum, but higher than those in the Neisseria species (Table 10). This phenomenon is similar to that observed in the number of distribution of transcription factors in L. hongkongensis, N. gonorrhoeae, N. meningitidis and C. violaceum as described above. On the other hand, the L. hongkongensis genome possesses two copies of cspA which encodes cold shock transcription factor and one copy of cspD which encodes cold shock protein homologue (Table 10). There is only one copy of cspA in the genomes of N. gonorrhoeae, N. meningitidis and C. violaceum, whereas cspD is absent from the genomes of N. gonorrhoeae and N. meningitidis. L. hongkongensis can survive in and adapt to a variety of ecological niches, including water and the intestines of freshwater fish, frogs and humans, with different osmotic stress. A total of 25 CDSs in the L. hongkongensis genome could be related to control of osmotic pressure (Table 11). Most of these CDSs encode proteins and their regulators for transport of potassium ion, proline and glutamate. Among the 25 CDSs, 11 of them are related to potassium ion transport (nine and two for potassium uptake and efflux respectively); whereas only nine CDSs present in the C. violaceum genome and three in the N. gonorrhoeae and N. meningitidis genomes are related to potassium ion transport (Table 11). In addition to the 11 CDSs related to potassium transport, five other CDSs encode mechanosensitive channel proteins. These channels allow a quick and transient increase in compensatory solute (e.g. proline and glutamate) flux out of bacterial cells in response to large turgor pressure generated by water influx due to osmotic downshock when the bacterial cells are transferred to environments of low osmolarity . Interestingly, a betT gene that encodes a transport protein for choline uptake is present in the L. hongkongensis genome. However, the betA and betB genes, that encode enzymes for metabolizing choline to glycine betaine, the osmotically active compound, are absent . Similarly, the glpR and glpK genes are present. However, the glpF gene, another gene in the glpFK operon that encodes the glycerol uptake facilitator protein, is absent . Therefore, the contributions of betT, glpR and glpK and their corresponding choline and glycerol transport systems to tolerance of osmotic stress in L. hongkongensis are unknown. The expressions of two other CDSs, osmB and osmC, which encode two osmotically inducible lipoproteins, have been found to be affected by change in osmolarity in E. coli[72, 73]. Both osmB and osmC are membrane proteins of unknown function. In E. coli, it was observed that deletion of osmC will render the bacterium more sensitive to oxidative stress because of its peroxidase activity . 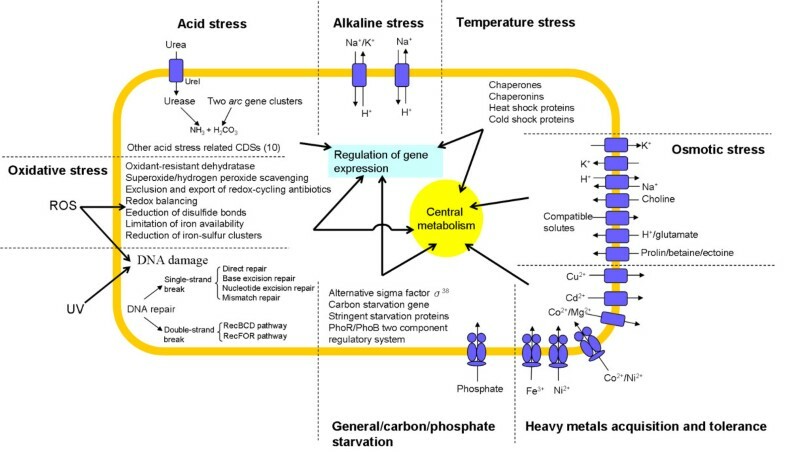 Oxidative stress on aerobic bacteria is mainly mediated by partially reduced oxygen species, or reactive oxygen species, most notably superoxide and hydrogen peroxide, that are inevitable by-products of aerobic metabolism. These reactive oxygen species can cause damage to DNA, proteins and membranes. As a result, all aerobic bacteria possess various mechanisms to scavenge superoxide and hydrogen peroxide , as well as to protect the cells from damaged by these reactive oxygen species. In most bacteria, inducible responses to superoxide stress and hydrogen peroxide stress are mediated through the transcription factors SoxR(S) and OxyR respectively, which command the induction of a battery of defensive proteins, including superoxide dismutase and catalase respectively . In the L. hongkongensis genome, genes for oxidant-resistant dehydratase (fumC, acnA), superoxide scavenging (sodB), hydrogen peroxide scavenging (ahpC, cpx), exclusion and export of redox-cycling antibiotics (acrA, acrB, tolC), redox balancing (nfnB), DNA repair (xthA, nth, mutM, mutY, mutT), reduction of disulfide bonds (trxA, trxB, gpxA, gshA, gshB, grxA, grxC, gor) , limitation of iron availability (bfr, dps, fur) and reduction of iron-sulfur clusters (fpr, yggX) are present (Table 12). Transcriptions of most of the genes are regulated by SoxR(S) and/or OxyR transcription factors in other bacteria (Table 12) . In addition, some genes may be regulated by other transcription factors, such as RpoS, FNR , Fur and Lrp [80, 81]. Interestingly, SoxR(S) is not present in the genomes of N. gonorrhoeae, N. meningitidis and N. lactamica and the role of SoxR(S) is presumably taken up by other transcription factors . Notably, SoxR(S) was also not found in the L. hongkongensis genome by BLASTp search. CDSs related to tolerance of oxidative stress in L. hongkongensis, C. violaceum, N. meningitidis and N. gonorrhoeae. In addition to oxidative stress, ultraviolet light is another environmental stress that damages the DNA of a bacterium. The genomes of L. hongkongensis, C. violaceum, N. gonorrhoeae and N. meningitidis all contain one copy of phrB which encodes a photolyase for direct repair of DNA; and one copy each of uvrA, uvrB, uvrC and uvrD in the nucleotide excision repair system. L. hongkongensis is arguably fastidious: it is asaccharolytic, metabolizing none of the common sugars, requiring malate, adipate or caprate as its carbon source [1, 4, 43]; in the laboratory, its optimal growth requires brain-heart infusion (BHI) instead of commonplace lysogeny broth (LB) (unpublished data). Thus the pivotal study published in 2007, describing the isolation of L. hongkongensis from six of the 10 surveyed drinking water reservoirs in Hong Kong, prompts inquiries into the mechanisms of survival and persistence of this bacterium in nutrient-poor environments . In many natural waters, nutrients are scarce. An average of the reservoirs from which L. hongkongensis were isolated demonstrates such: the permanganate value, a surrogate for organic carbon content, had a yearly mean of 1.25 mg O2/L; ammoniacal nitrogen, 0.05 mg N/L; and total phosphorus, 0.015 mg P/L . This is in stark contrast with even so-called "minimal medium", in which the malate content measures 2000 mg/L; ammoniacal nitrogen 9.0 mg N/L and total phosphorus 17 mg P/L . Clearly, L. hongkongensis has exquisite adaptive abilities which enable its survival in environments such as the drinking water reservoirs. With limited nutrients, bacteria do not continue their exponential growth indefinitely. Instead, they move into the stationary phase; cells lose viability and enter the death phase; in prolonged periods of nutrient depletion, a resistant subpopulation survives and the extended stationary phase ensues . To adapt to stress conditions as such, alternative sigma factors enable bacterial RNA polymerase to transcribe an alternative subset of its genes. In the stationary phase, the starvation/stationary phase sigma factor, σ38, encoded by rpoS, is used to upregulate the expression of a number of genes. Some of these genes may be clustered with rpoS: in L. hongkongensis a surE-pcm-nlpD-rpoS cluster was observed (LHK_00356-00353). This is similar to C. violaceum ATCC12472 (CV_3679-3682), and was also observed in other pathogens such as E. coli, Salmonella Typhimurium  and Yersinia pestis. In the L. hongkongensis surE-pcm-nlpD-rpoS cluster, there is an overlap between the surE and pcm genes; which was also observed in C. violaceum. Despite this overlapping, as shown in E. coli, the pcm gene can either be co-transcribed with the surE gene or transcribed on its own . A CDS coding for the putative gene surA precursor is present in the L. hongkongensis genome (LHK_03194). This survival protein precursor was also found in C. violaceum, N. meningitidis, N. gonorrhoeae and E. coli. SurA, the periplasmic chaperone protein encoded by this gene, is responsible for the proper folding and insertion of a subset of outer membrane proteins in E. coli. It is of interest, however, to note that the SurA precursor protein is only expressed at 37°C, but not the environmental temperature of 20°C, when L. hongkongensis is cultured in the rich medium of BHI . It is unknown, therefore, whether temperature may have a more generalized effect on the starvation response of L. hongkongensis. In the L. hongkongensis genome, only one CDS coding for the putative carbon starvation gene cstA2 was found (LHK_00676). This is similar to N. gonorrhoeae and N. meningitidis, but different from the C. violaceum genome, which contains two CDSs coding for the putative genes cstA1 and cstA2. The E. coli homologue of the L. hongkongensis cstA2 gene is cstA. CstA is a starvation-induced peptide transporter in E. coli, and has been implicated in peptide utilization . CDSs coding for putative genes sspA and sspB are present in the L. hongkongensis genome (LHK02886-02887). Putative homologues of sspA and sspB are also present in C. violaceum, N. meningitidis, N. gonorrhoeae and E. coli. In E. coli, sspA and sspB code for the stringent starvation proteins SspA and SspB. Whilst SspA is essential to expression of SspB, it has also been found to be upregulated in the starvation response to glucose, nitrogen, phosphate and amino acids . SspA and SspB are probably not implicated in the sugar starvation response of L. hongkongensis, if any, since the bacterium is asaccharolytic. It is uncertain, nevertheless, whether carbon starvation, i.e. of malate, caprate and adipate, may lead to upregulation of the putative sspA and sspB genes in L. hongkongensis. It has long been observed that phosphate is often the limiting nutrient of algal and bacterial growth in freshwater environments [92–94]. Bacteria have evolved various mechanisms to enhance the uptake of phosphate, even by cell envelope elongation to increase the surface area to volume ratio ; albeit a relationship is yet to be ascribed to the seagull or spiral rod shape of L. hongkongensis. From the freshwater reservoir data stated above, phosphate is probably the scarcest nutrient amongst carbon, nitrogen, phosphorus and iron with its concentration of 0.015 mg P/L (or 0.5 μM). On the other hand, however, it is worthwhile to note the more recent finding that phosphate depletion may enhance bacterial resistance to multiple antimicrobials [96, 97]. Phosphate homeostasis in bacteria is mainly achieved by the PhoR/PhoB two-component regulatory system (TCRS). In L. hongkongensis, the putative genes coding for the PhoR/PhoB are adjacent to each other (LHK_00166-00165), as in C. violaceum (CV_0563-0562). The N. gonorrhoeae and N. meningitidis homologue of the phoR and phoB genes, however, could not be identified. The PhoR/PhoB TCRS is closely related to the phosphate-specific transport (Pst) system. In E. coli, there is a pstSCAB-phoU operon in which the genes pstS, pstC, pstA, pstB and phoU are clustered. This is not the case in L. hongkongensis, C. vioalceum, N. gonorrhoeae and N. meningitidis. In L. hongkongensis, the putative pstSCAB locus (LHK00524-00521) is well separated from the CDS coding for the putative phoU gene (LHK_00885). In C. violaceum, this separation is also seen (pstSCAB: CV_0938-0935; phoU: CV_1261); the pstSCAB locus is also clustered with the putative pitA gene, which codes for a low-affinity inorganic phosphate transporter (CV_0934). In contrast to such, the CDS that encodes the putative pitA gene in L. hongkongensis is separated from the putative pstSCAB locus (LHK_02538). It is believed that the PstS, PstC, PstA and PstB proteins, together with PhoU, are responsible for the formation of an ABC transporter in the capture of periplasmic inorganic phosphate. In an abundance of phosphate, the Pst system, together with the histidine kinase PhoR, repress the transcription regulatory protein PhoB. When the extracellular phosphate concentration is below a threshold value, for example 4 mM in E. coli, autophosphorylation on a PhoR histidine residue occurs; the phosphorylation is subsequently transferred form phospho-PhoB, which modulates Pho regulon activities [98, 99]. Metabolic scheme illustrating the mechanisms of response of Laribacter hongkongensis to different environment and stress as deduced from its genome sequence. Different environmental stresses and the corresponding genes in L. hongkongensis are shown as indicated (separated by broken lines). Line arrows indicate the flow of pathway. Solid arrows indicate the flow of substances through transporter. Transporters including uniporter, antiporter, symporter, and P-type ATPase are shown as blue rectangular box. ABC transporters are shown as composite figure of 2 circles, 2 ovals and 1 horizontal oval. Integrated view of central metabolism is presented as yellow circle. Integrated view of gene regulation is presented as light blue rectangle. arc, arginine deiminase; Cd2+, Cadmium(II) ion; Co2+, Cobalt(II) ion; Cu2+, Copper(II) ion; Fe3+, ferrous ion; H+, hydrogen ion; H2CO3, hydrogen carbonate; Mg2+, Magnesium(II) ion; Na+, Sodium ion; NH3, ammonia; Ni2+, Nickel(II) ion; K+, Potassium ion; ROS, reactive oxygen species; UreI, urea transporter; UV, ultraviolent light. All CDSs in the L. hongkongensis genome were annotated as described in our previous publication and classified functionally according to the Clusters of Orthologous Groups system . Annotated genes were mapped to pathways according to the Kyoto Encyclopedia of Genes and Genomes database to help identify stress-response pathways. The CDSs were members of COG L (replication, recombination and repair), COG K (transcription), COG F (nucleotide transport and metabolism) and COG O (post-translational modification, protein turnover, chaperones). Additional CDSs were examined by keyword search using the following words and their variants: stress response, regulation, adaptation, temperature, ultraviolet, acid, alkali, pressure, oxidative, homeostasis and resistance. Manual confirmation of the assigned function was performed by sequence similarity search using BLAST against the NCBI nr database, and assisted by conserved domain search (CD-search), identification of signature sequence motifs and sequence analysis using InterProScan. Cellular localization of putative proteins was predicted using PSORTb where appropriate . Phylogenetic relationships were determined using Clustal × version 1.81. oriC was predicted by Ori-finder http://tubic.tju.edu.cn/doric/. Susanna KP Lau and Patrick CY Woo contributed equally to this work. PCYW, KYY and SKPL designed and supervised the study. RYYF, TCCH, GKMW, AKLT, JLLT, WC, RMW and SOTC annotated the genome. HT performed bioinformatics analysis. SKPL, RYYF, TCCH, RMW and PCYW drafted the manuscript. All authors corrected the manuscript. All authors read and approved the final manuscript.